Ir Amim reports that on October 4th, the Jerusalem District Planning and Building Committee will discuss – and is expected to advance – two plans to expand settlements along the northern perimeter of East Jerusalem: a plan for 500 new units in the Ramat Shlomo settlement and a plan for 152 new units in the Ramot settlement. If implemented, both plans will compound the encroachment of settlements on the Palestinian East Jerusalem neighborhood of Beit Hanina; the Jerusalem Municipality only recently approved the first-ever settlement construction inside Beit Hanina. These two plans are just the latest advancements for Ramot and Ramat Shlomo: in August 2018 a plan for 263 units in Ramot was deposited for public review, and construction tenders were published for a plan for 603 units in Ramat Shlomo (under what is colloquially known as “The Biden Plan”). 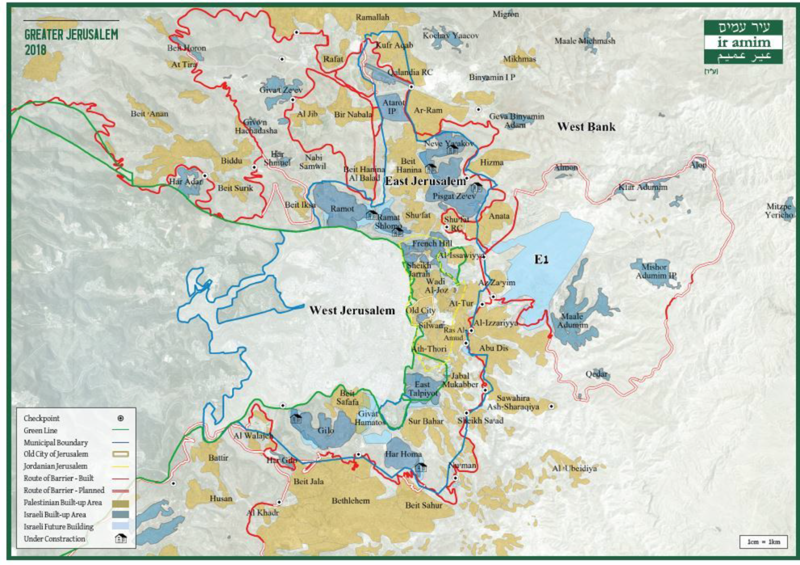 “[The Ramot plan] represents a bold push toward Israel consolidating control of the undeveloped area between Ramot and Bir Nabala. 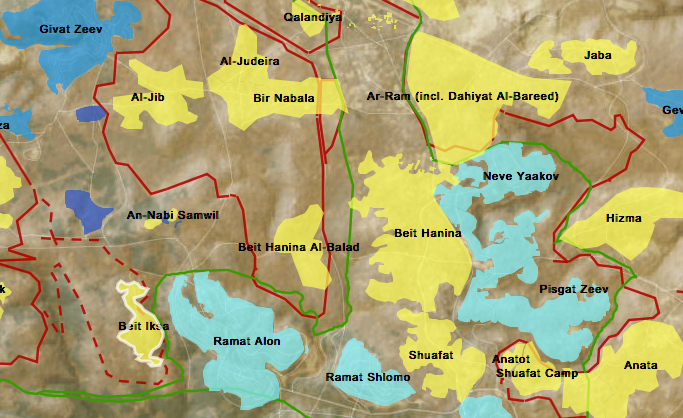 Ir Amim has acquired documents showing plans to expand the entire northern section of the Ramot settlement toward the Palestinian area. As can be seen on the map, the large open area between the Israeli settlement and the Bir Nabala enclave is already cut by the Separation Barrier, which completely encircles the enclave, isolating its residents from the surrounding Palestinian space and imposing severe economic hardship.” [Editor’s note: for more on how the separation barrier has completely isolated the East Jerusalem neighborhood of Bir Nabala, see this short video by The Guardian]. Reported above, 152 new units in Ramot settlement in August 2018. Ma’an News reports that the radical Elad settler organization has evicted a Palestinian family from a building that settlers purchased in the East Jerusalem neighborhood of Silwan. The previous owners of the building, who currently live in the U.S. – reportedly notified tenants at the property of the sale several months ago. The settlers, under the protection of Israeli security forces, did not allow the evictees – 7 members of the Maswadeh family – to move their belongings out of the building before moving in. The Maswadeh family had rented two apartments in the building for the past 30 years. According to reports, the settlers have already started to build what appears to be a gate to control access to the property. Haaretz published a lengthy profile of the Kohelet Policy Forum, a right-wing advocacy organization that wields enormous influence over senior Israeli government figures, including Justice Minister Ayelet Shaked (Likud). The Kohelet Policy Forum is revealed to have played a major role in shaping several of the most significant pro-settlement, pro-annexationist legislative actions in the past year, including the high court override bill, the Nation-State Law, and a bill that would allow Israeli cabinet ministers to select their own personal legal advisors. According to Haaretz, the Kohelet Policy Forum’s fingerprints “are visible in every explosive and divisive issue that has weakened the legal system and regulations.” FMEP tracks all these pieces of legislation, and many more, in its Annexation Policy Tables. The funding sources for the Kohelet Policy Forum, which was established in 2013, are worth noting: the largest funder is an anonymous donor in the United States, who funds were transferred to Kohelet via an American nonprofit called American Friends of Kohelet Policy Forum. In 2016 the American group donated about 7.8 million shekels ($2.1 million) to Kohelet; in 2017 about 28.5 million shekels ($7.7 million). In light of Kohelet’s agenda, the anonymity of Kohelet’s major U.S. funder escapes the ire of the Israeli government, which has sought to stigmatize and shutdown groups which draw the majority of their funding from foreign sources. Another main funder is the Tikvah Fund, a wealthy U.S.-based organization with a mission to promulgate American Republican Party views in Israel. Since its founding, the Kohelet Policy Forum has received over $1 million from the Tikvah Fund, and the two entities share board members. The Tikvah Fund also supports pro-settlement organizations. Notably, Eugene Kontorovich is the head of the international law department at the Kohelet Policy Forum. Kontorovich self-identifies as a key figure in the drafting of “anti-BDS” (but actually, anti-free speech/pro-settlement) laws in the United States. At the core of these laws is the conflation of Israeli settlements with Israeli proper, based on Kontorovich’s argument that Israel is not occupying Palestinian territory. Kontorovich has also testified multiple times to U.S. Congress, including in support of moving the U.S. Embassy to Jerusalem; in support of Congress legislating U.S. foreign policy, including with regard to Jerusalem; on the impact of the BDS movement, and in support of U.S. recognition of Israel’s sovereignty over the Golan Heights.